Rubber Mulch Paving has a large range of uses including median strips, around trees, garden areas or anywhere a permanent surface is required. • The product is dense enough to eliminate weeds. This reduces the need for spraying and maintenance. • It can be produced in any thickness (wet pour installation). COLOUR OPTIONS AVAILABLE. • It is very durable and has a life expectancy of over 10 years. 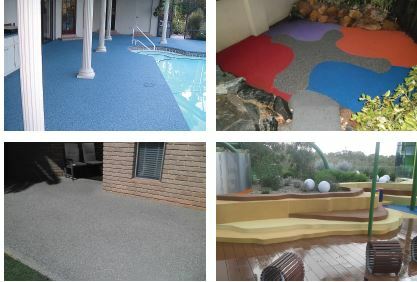 • It has the advantage that in heavy traffic areas it cannot be scattered creating an unsightly mess and a slip hazard. • Around trees it can be adjusted to allow for growth. • It does not rot or wash away. • It is manufactured out of recycled materials. • Because of its life longevity it is very cost effectiveness compared to other alternatives. Astro’s new product, Pebble Stone Paving is a resin bond permeable paving product that is ideal both for internal and external applications. undulating or damaged existing concrete,soil or Brick pavers. Low maintenance – no weeds, puddles or loose stones to sweep up. • Ideal for pathways and driveways. Can be installed over existing driveways and pathways without any demolition work. • Also suitable for balconies, courtyards and tree surrounds. • It is UV stable – reduces fading. • Ideal for pool surrounds and aquatic centres. • Slip-resistant due to its textured surface that allows water to run through preventing puddles forming. 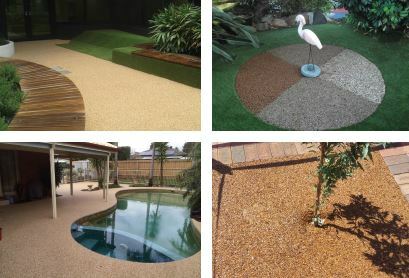 Porous Pebble Rubber Paving is suitable for patio, alfresco, balcony, children’s playgrounds, pathways, and around swimming pools It can be used to re-surface old brick pavers or concrete, so there is no need for removal of the existing surface prior to installation. • High density seamless product, specially designed for higher endurance. • More porous surface than conventional rubber. • Provides a cushioned, non-slip surface for areas that would otherwise be slippery. • Firm enough to support wheelchairs, walkers, electric scooters and outdoor furniture. • Available in a wide range of colours. • Freshens and brightens up old, worn surfaces, enhancing them beyond their original finish. • Safety surface – If you drop a glass it bounces and does not shatter. • Installed in aged care homes and rehabilitation centers for safety and comfort. • Manufactured to Australian safety standards walkers, electric scooters and outdoor furniture. 30mm high pile natural life like fresh appearance, 3 tone product Specified for harsh heavy duty use with minimal pile crush. Constructed with a solid pile fibre for support of the leaf which helps retain the natural appearance of the turf. 40mm high pile, prestigious, soft natural look turf constructed with a C Shape fibre and bound with a heavy mesh backing. Manufactured for all purpose use and minimal pile crush. Considered a 5th generation turf above all the rest. 15mm high pile, mono colour, tight stitch rating for an even non directional ball roll, twist fibre and heavy duty mesh backing for strength and durability. This quality turf is suitable for putting areas, tennis courts, sporting surfaces.